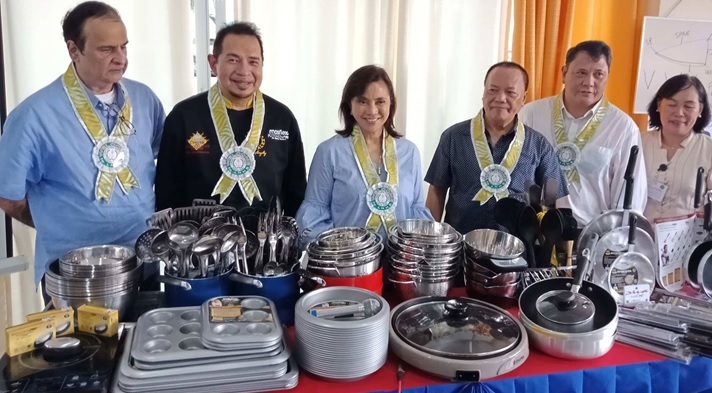 Vice President Leni Robredo arrived in Bohol on Thursday to personally hand over kitchenware, cookware and other kitchen equipment to the Lourdes National High School in Panglao and offer culinary scholarships to students. The donation which would benefit senior high school students taking up a cookery course at the school was made through Robredo’s flagship anti-poverty program, Angat Buhay. Homegrown kitchenware and cookware company Masflex, through its partnership with Angat Buhay, donated items from its Kitchen Pro line of culinary products. “Yung isang partner diyan yung Masflex. Naging partner namin siya because of the Indian Chamber of Commerce,” Robredo said. The Vice President was accompanied by Gene Gonzales, chef-owner of Café Ysabel in San Juan City and the founder of the Center for Asian Culinary Studies, who conducted a cooking tutorial for students of the Lourdes National High School. Gonzales also offered scholarships to the future high school graduates. According to Robredo, the Angat Buhay program which implements various poverty alleviation programs starting 2016 has reached 176 municipalities across the country. “Noong nag-umpisa kami in 2016, naghanap kami ng mga pinaka-mahirap na families. Pumili kami ng 50. As we went along, nakita namin na mayroong mga opportunities to help, so ngayon nasa 176 communities na kami including Panglao,” said Robredo. The Angat Buhay program is largely dependent on private partnerships as the Office of the Vice President (OVP) has limited budget, she added. Robredo earlier this year said the OVP has sourced more than P250 million to benefit the poor. Allocation of the budget will be focused on “public education, universal health care, world development, women empowerment, housing and resettlement,” she said.